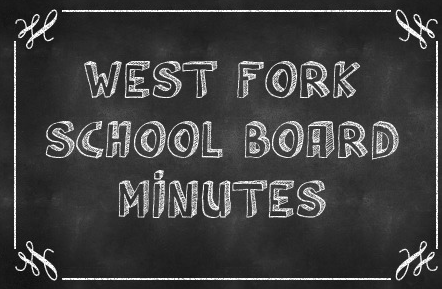 The West Fork Board of Education met for its regular meeting in the Superintendent’s Office in Rockwell. The meeting was called to order at 5:00 PM by Board President, Jim Tuttle. Board members present: Mary Schlichting, Mary Beth Sukup, Roger Witte and Rob Heimbuch. Also present were Superintendent Darrin Strike, High School Principal Clyde Tarrence, Middle School Principal Tracy Peterson and West Fork Board Secretary Lacey Pueggel. After discussion, Heimbuch moved to approve the Agenda, with an omission of item #20, the Minutes from July 18, 2016, and the August Bills; seconded by Sukup. Motion carried 5-0. Lisa Lehman shared information on the Home School Assistance Program. After discussion the board agreed to pursue the program. Witte moved to proceed with a draft plan containing more information on the Home School Assistance Program; seconded by Sukup. Motion carried 5-0. Sukup moved to approve the resignation of para educator, Deanna Perkins; seconded by Heimbuch. Motion carried 5-0. Witte moved to approve the resignation of para educator, Emily Akins; seconded by Schlichting. Motion carried 5-0. Schlichting moved to approve the resignation of para educator, Melissa Lambertson; seconded by Heimbuch. Motion carried 5-0. Witte moved to approve the resignation of Middle School AD, Eric Gabe; seconded by Schlichting. Motion carried 5-0. Sukup moved to approve a contract to Pat Smit to serve as Kitchen support in Sheffield; seconded by Schlichting. Motion carried 5-0. Heimbuch moved to approve a contract to Donna Siems to serve as a Custodian in Sheffield; seconded by Sukup. Motion carried 5-0. Sukup moved to approve a contract to Wanda Kruse to serve as a bus driver; seconded by Witte. Motion carried 5-0. Heimbuch moved to approve a contract to Nick Ries to serve as a bus driver; seconded by Schlichting. Motion carried 5-0. Sukup moved to approve a contract to Trent Trask to serve as Middle School Athletic Director; seconded by Schlichting. Motion carried 5-0. Heimbuch moved to approve a contract to Trent Trask to serve as an At Risk Para educator at the Middle School; seconded by Sukup. Motion carried 5-0. Heimbuch moved to enter the Public Hearing to discuss the potential lease of the Wellness Center Room; seconded by Sukup. Motion carried 5-0. Members of the Wellness Center Committee and community shared reasons why they are an advocate for leasing the area in the Wellness Center. Community members also shared their concerns. After discussion, Schlichting moved to exit the Public Hearing; seconded by Heimbuch. Motion carried 5-0. Supt. Strike presented the board with 2 proposals for leasing the space. 21st Century Rehab and Synergy submitted bids to lease the space in the Wellness Center. Heimbuch moved to approve the bid from Synergy subject to finalization of lease terms as reviewed and approved by our Attorney, Superintendent and Board President; seconded by Sukup. Motion carried 4-1. Ayes: Sukup, Schlichting, Tuttle, Heimbuch. Nays: Witte. Supt. Strike presented the board with 2 bids for cardiovascular equipment for the Wellness Center. After discussion, Heimbuch moved to approve the bid from Wayne Ski and Cycle for 9 pieces of cardio equipment for $22,177.42; seconded by Sukup. Motion carried 5-0. Witte moved to approve a contract to Alyssa Noss to serve as a para educator and special education transportation support; seconded by Heimbuch. Motion carried 5-0. Schlichting moved to approve a contract to Lacey Dawkins to serve as a para educator; seconded by Sukup. Motion carried 5-0. Witte moved to approve a contract to Denise Tarrence to serve as a para educator; seconded by Sukup. Motion carried 5-0. Sukup moved to approve a contract to Becky Robinson to serve as a para educator; seconded by Schlichting. Motion carried 5-0. Heibmuch moved to approve the following as volunteer coaches: Dustin Pillard for Football, Amy McKee for Dance, Roxanna Johnson for Dance, Taylor Rooney for Cheerleading; seconded by Sukup. Motion carried 5-0. Heimbuch elected Mary Schlichting to serve as West Fork’s representative on the delegate assembly at the IASB conference in November; seconded by Witte. Motion carried 5-0. Witte moved to approve the Open Enrollment requests as presented; seconded by Heimbuch. Motion carried 5-0. Sukup moved to approve the bid for $7,500 from Janssen Waterproofing to make general tuck pointing repairs at the Rockwell Campus; seconded by Heimbuch. Motion carried 5-0. Baseball field Right Field needs repairs – 20 loads of black dirt (Iowa Drainage) $4,500 with an additional cost of seeding and etc. Witte moved to adjourn the meeting at 7:45pm; seconded by Heimbuch. Motion carried 5-0.